Through the end of October, thousands of volunteers from all parts of the state will be working together to clear trash from our roadways, parks, lakes, rivers and public areas as part of The Great Arkansas Cleanup. 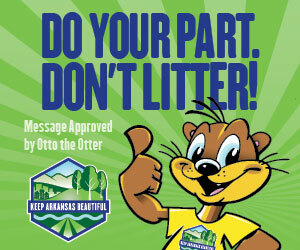 The Keep Arkansas Beautiful Commission provides supplies, including trash bags, gloves and T-shirts, to dozens of registered cleanups. Visit the keeparkansasbeautiful.com website to find cleanups that beautify your community — or to register one yourself. Help keep The Natural State free of litter, especially in your own neck of the woods.